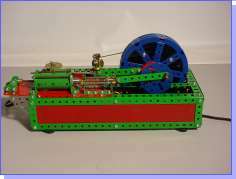 Using the principles of a horizontal steam engine I constructed a model in which the steam cylinder is replaced by an electromagnet with a moving core. The construction details of the model are of little importance, as the photos give all the information you need. 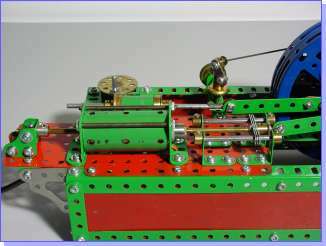 The cylinder is replaced by an coil, while an iron core replaces the piston of a steam engine. The construction details of both are shown in the photos below. If the core is placed about half of its length into the coil, and the current is then switched on, the core will be sucked right into the coil. The current will then be automatically switched off by the associated electronics. The core keeps on moving, due to the energy stored in the flywheel, until it comes out at the other end of the coil. When the current is then switched on again the action repeats in the opposite direction. The core (piston) is pulled alternately backwards and forward thus forming a reciprocating engine. 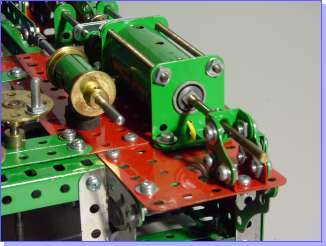 Two slotted opto switches are used to control the electromagnet and regulate its speed, placed as shown in the photos below. The slotted opto switches are mounted on the same printed circuit boards (PCBs) that I used in my Cliff Lift model. 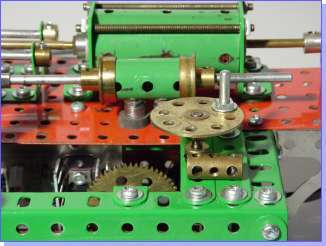 The only difference is that one third of each has been cut off due to the proximity of the slotted opto switches to the gearwheel in this model. 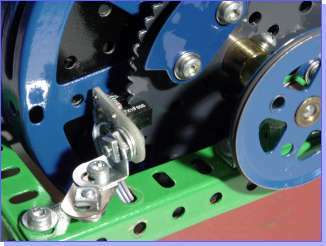 The first slotted opto switch switches the electromagnet current on and off using two shutters mounted on a gearwheel (Meccano part 95b) coupled to the flywheel. 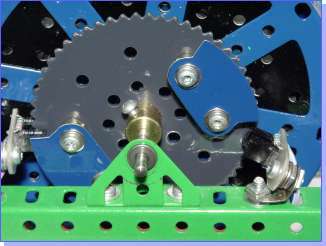 The second slotted opto switch measures the speed of the engine using the teeth of the same gearwheel. This speed information controls the current through the coil and acts as a regulator. Figure 2 shows the block diagram of the system, and figure 3 shows the full circuit diagram. The circuit diagram can also be downloaded separately from the link below. 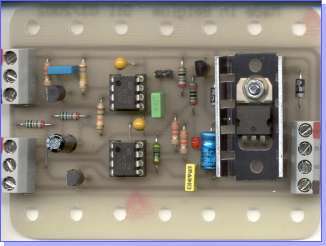 IC1 is a 555 timer and it is configured as an astable. Using the Reset input (pin 4), the Output (pin 3) is switched on and off under the command of the On/Off slotted opto switch sensor. The square wave signal at the output of the 555 drives a power MOSFET transistor BUZ11. A second 555 timer, IC2, is configured as a monostable. It is triggered by the Speed slotted opto switch sensor and transistor T1. The output pulses are integrated to form a DC component used as control voltage for IC1 (input into pin 5). The control voltage has the effect of changing the frequency and the duty cycle of the square wave signal output from pin 3. 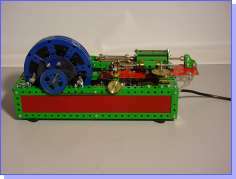 The current through the coil will therefore vary from 0.5A to 4A and so the engine will run at a constant speed. 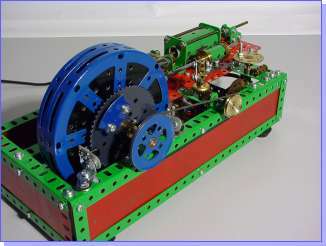 The speed can be set using a potentiometer to change the monostable time period of IC2. If you have the facilities to produce printed circuit boards, you can build the circuit using the PCB design which is available to download in GIF format below. To make printing the design at actual size easier, it is also available in a Microsoft Publisher file which can also be downloaded from the links below. This file also includes the component layout diagram which is also shown in figure 4. The size of the PCB should be 3.5" x 2.5". The 14 mounting holes in the PCB should be drilled using a 4mm bit so that they accept Meccano bolts. 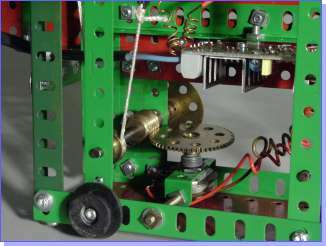 The photos below are close-ups of the speed setting potentiometer and mechanism, piston, and circuit. Here is a list of parts required to build the circuit in figure 3 on the PCB given in figure 4. It includes a reel of insulated wire for the coil. The BUZ11 transistor is unavailable from Rapid.